Back in the day, many of us celebrated our 21st birthday with a big Shebang Hooly Dooly party with birthday cards and cakes embellished with keys ( key to the door symbolising adult independence) pewter tankards (you can ‘officially’ drink now. Oh really?) and other emblematic gifts denoting our newly acquired status as adults. Does this still go on? Mr Contract Lawyer Tranquillo used to ask this of his 20 something year old students. Who had a 21st birthday party? What did it mean to you and why? He was often met with blank stares. In Australia, 18 year olds can vote, go to war, drive a car, drink, sign contracts, own credit cards, buy houses, marry, and do all the other things expected of an adult. The fact that many ‘adults’ still live at home and behave like children is beside the point. Some will continue at home well into their 30s and, if Australia copies Italian trends, become Mammoni ( mummy’s boys). I note here that there doesn’t seem to be a language equivalent for women. young people do RSVP, especially now that security doormen are employed to check the party list. Great, you will have a fair indication of the numbers and so can cater sensibly. young people come, but they don’t necessarily stay. They arrive in a big tsunami, and then leave a few hours later. young people don’t eat much at parties. if they do eat at all, they prefer simple, recognisable, easy to handle, fodder food. Nothing flash or foody! those who get to stay, the inner circle, drink a lot. Those who drove to the party can’t have a single drink. That may explain the early exodus of some guests. Many walk or come by public transport. They are adults so drop the concern. it’s good to have a few older folk around, at least they eat all the food you have prepared. They also like to drink wine, not shooters. Well, most do…..pass me a Cowboy! a DJ, although expensive, is a good idea even if you hate doof-doof. tell all the neighbours about the party well in advance. having a few cooks on the job, other than the hosts, is a great idea. If cooking, wear sensible shoes. No one will notice your runners, I promise. have a few spare mattresses for the over- nighters and some buckets. I’ll spare you the graphic details. and, remember, they are really kids, despite their new legal status. Be nice and a little vigilant but have fun too. The catering went well, although our family has a tendency to over cater. This time, not much food was wasted. pizze were made ahead and frozen. Pizze were baked on rectangular trays and cut into squares, producing 16- 20 per batch, depending on tray size. Making the dough in a bread machine makes things easy. 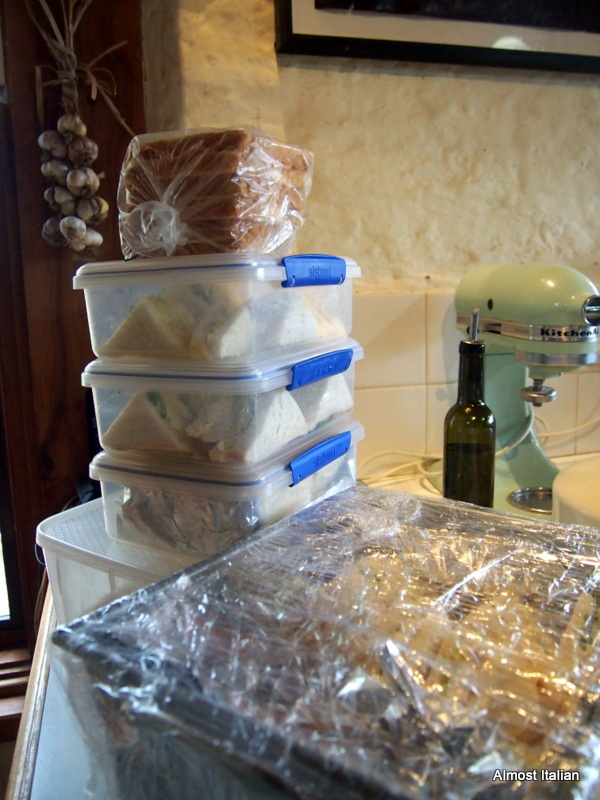 As a new dough is mixing and rising – taking 90 minutes- the previous dough is rolled out, anointed with chosen toppings, cooked, cooled, sliced, wrapped then frozen. Repeat this all day until you fall over and yell “Hold, enough” and reach for the wine. Make sure that all the toppings are cut, sliced and ready to go. Also make sure that there is an equal mixture of meat and vegetarian and a dairy free version such as a Pissaladiere. Eight trays will produce a goodly amount. On the night, bring them from the freezer and gauge demand. Leftovers make a great after party pick me up. 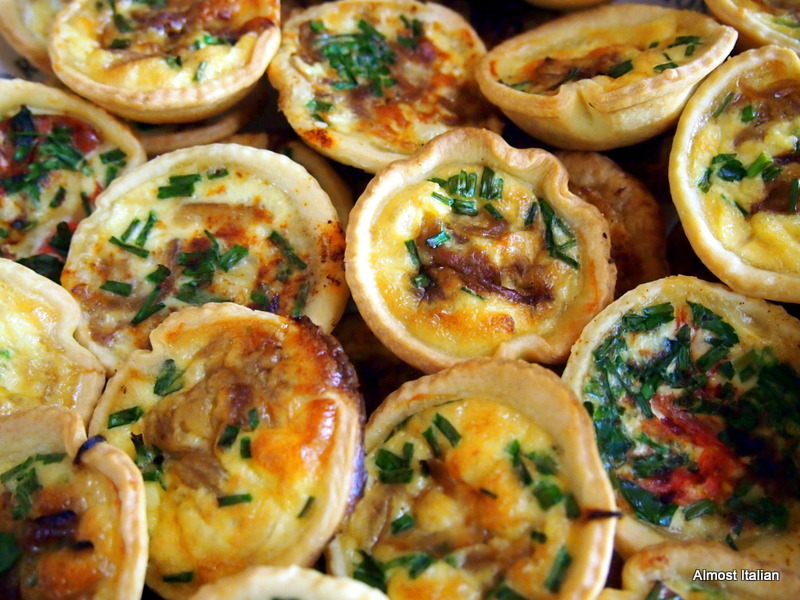 Mini Quiche. These were really popular with the hungry older adults. 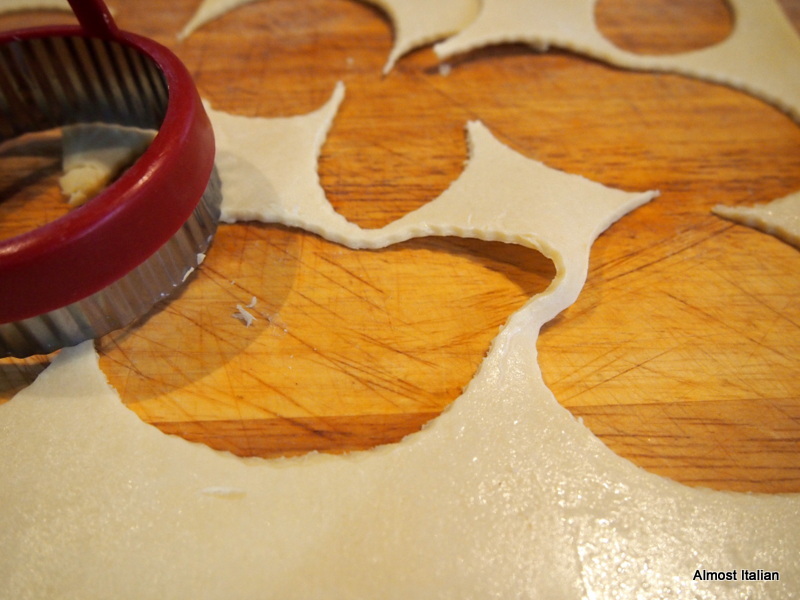 Use commercial short crust pastry sheets. These make the job much easier. One packet of five sheets will yield 60 pies, less the ones you eat along the way! 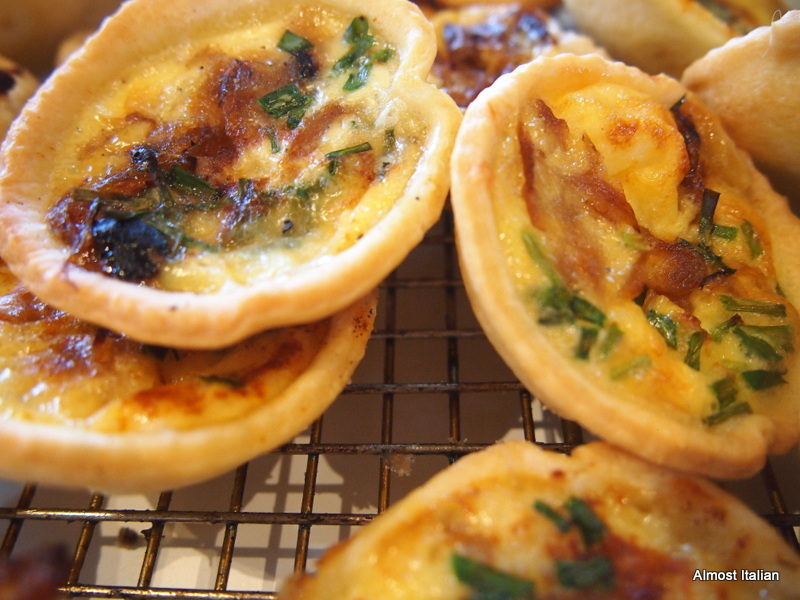 Use left over caramelised onion from the pissaladiere, tasty cheese, chives, herbs, hot smoked salmon, pesto, whatever is on hand. Save the scraps of pastry for a post party jam crostata. Sandwiches cut into points. Everyday fillings were popular, such as, shredded chicken ( store-bought roasted chicken) with mayo and chives, ham and cheese, hard boiled egg, herbs and mayo. These need to be made on the day and boxed in airtight containers. Search out a bakery that will cut a block loaf of white bread into sandwich slices. Have you noticed the size of the supposed sandwich slices from Coles bakery bread? They are just too fat for dainty point sandwiches. This was a major disappointment, and as the sandwich maker and general caterer, really annoyed me. Never again! At least bakeries can adjust their slicing machines. There were 17 slices to the Coles packet, often with one wasted as it was partly crusted. My chooks enjoyed the waste. So 16 slices of bread alla Coles =32 points x 4 packets of sliced bread= 128 points. Most of these were eaten, and those with mayo were better, given the nature of that bread. Sausage Rolls are always a winner and, predictably, they all disappeared. They were made using a traditional recipe and did not include carrots or any other vegetable matter except onion. 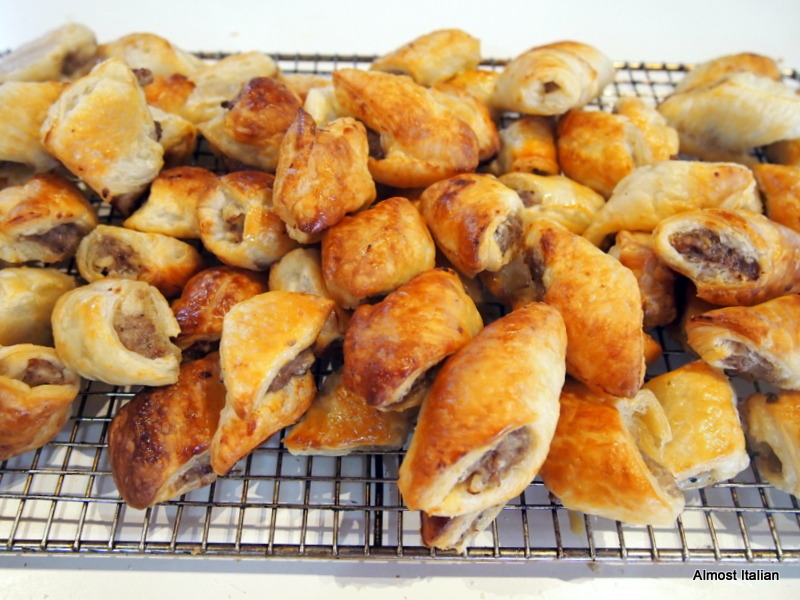 Commercial puff pastry – 9 sheets to a packet and one kilogram of sausage mince – produced 148 mini sausage rolls with one sheet of puff pastry left over. My daughter- in- law hoovered a few before the party! About that Costco purchased pre-made stuff. One packet of tiny pre-made blini at around $6.00 were disappointing and inedible, despite their lovely mascapone and smoked salmon topping. The pre-made frozen arancini were not good either. So it’s back to ‘made from scratch’ for this old party animal! Rachael does the blini. Where’s the dill? There were lots of other treats. Some beautiful stuffed mushrooms, met with disdain by the young adults, but welcomed by the older ones. Lots of helpers with cooking- thanks Sunshine, and bar people extraordinaire- Rachel B and Co. Lots of cleaners and sweet makers and dancing queens. Happy Birthday Mischa Belle! Ma chère petite fille and to you too Rachael, daughter and best friend. The birthday girl and her oldest friend. What an interesting post for me, having not grown up and reached my 18th year in Australia. It is even more interesting to me because our own daughter, much to her chagrin, is well passed her 21st, and wanted no parties at 18 or 21. It was very curious to us that she wanted neither but she declared they were way too much drama and fuss for her taste so for 21 we had a quiet, small but very nice dinner at home with her (then) boyfriend and his Mum (single parent). I must say, though, even that small event had me in a spin and recovering for days. I don’t know how you did it, help or no, but it sounds marvellous. And I do know from our daughter’s descriptions of attendance at other parties, and from chaperoning a couple as well, your observations are very accurate. My own 21st was a cake and a weekend of working at the Motocross race track my parents owned! Highly unimpressive, but we were raised not to expect much, so I didn’t. Sorry to have rambled so much. Lovely post, Francesca. I also had a low key event too for my 21st (18th birthdays weren’t big deal then). I already had two children at that point and so a family restaurant dinner was the a lovely event, Some kids don’t go for big parties- a family meal is often a much nicer thing. I enjoy your long comments Ardys- not rambling- just feels like we’re having a chat. Well done Francisca. 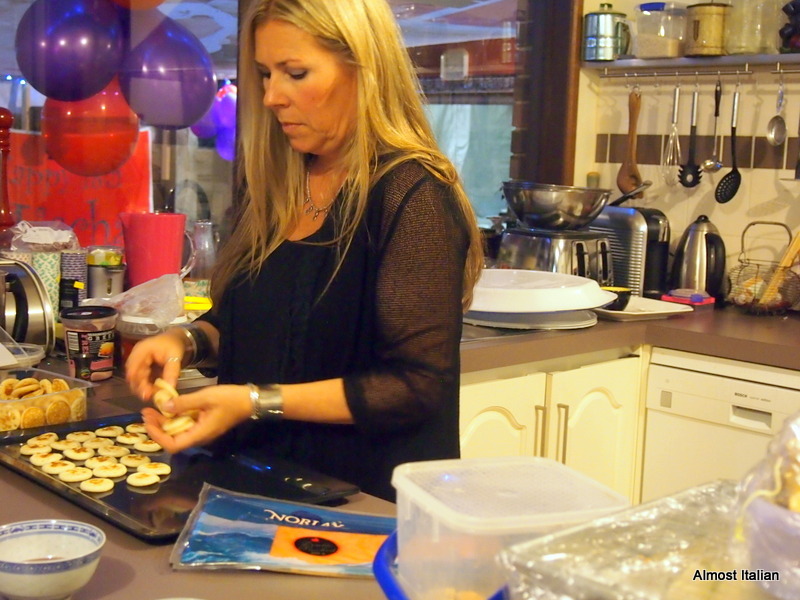 You’re a virtuoso of food preparation and display – you should run a hostel or maybe even a hotel. Thanks for the catering ideas too – the airlines could use some of this food on their flights! Thanks Blister Sister. No hotels for me- I’m over it. Thanks Rach and yes, my Rach has does a great job for 18 years. Now, does this sound like some sort of Rach cult? Sounds as if you survived all that cooking of finger food! Great description. It doesn’t sound as if teenage parties have changed too much since my kids time. Not surprised the preprepared stuff was crap, it’s about what I’d expect, gimme homemade anyday! You’re way too young to have an eighteen yr old grandie! Hahha, I had two kids before I had my 21st birthday, which was a modest outing with my parents at Copperwood in Lygon St. Child bride- me and Mr T.
No more crap stuff – in fact, no more catering! I can understand the ‘no more catering’ sentiment at this point in time! Nice work, I will try and remember your excellent pointers for when my babies get older. (Buckets…yoiks!) Only one big party, hear hear! The 18th has to be it methinks. The homemade food looks super. Lucky you had plenty of grown ups to gobble up the remainder. It is an odd thing that 18 year olds just don’t eat- maybe a sausage roll or two. They are juts too hyped up. Any further requests for large parties will involve a hired venue and caterer, or an alternative offer- a ticket to Bali. You’re a hoot! Points well noted. When my older brother was growing up, he had both an 18th and 21st. Me? I said to the genitori, I’ll have an airline ticket to Italy thanks! Una decsione saggia! How did you get to be so clever by 21 to request a ticket to Bell’Italia for your birthday? You have planted an idea and one which will be mentioned to the lass in question in 3 years time. We took her to Paris and Italy when she was 14 for 6 weeks and now she has the bug. This will be offered as the alternate- and cheaper too! Time does fly and it will soon be your turn Beck! !18 is the new 21! What an epic undertaking Francesca! It seems so long ago and I do remember my 21st with fond memories and the fact that someone spilled red wine on my parent’s white carpet but they were surprisingly okay about it (we got it cleaned). It was an epic, but we didn’t make too much food and it was all simple stuff. Red wine on white carpet- it had to happen! It sounds like a delightful party (hopefully you didn’t need too many buckets) and the food looks wonderful. Lucky kids and grown ups…I’ll take a few of those sausage rolls and some pizza as well. A bucket was required, lets just leave it at that. New adults are new drinkers too, and they don’t eat! Thank God it’s over! 65 teenage guests in total and all very well behaved. No issues other than a few uninvited people who promptly left when told no entry, including the neighbours kids who tried jumping the fence! 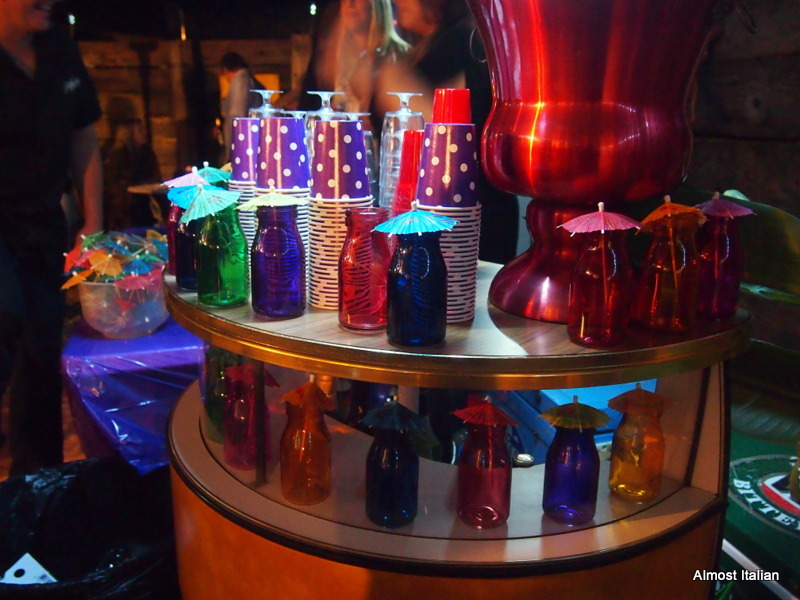 The adults partied way harder that night. The last teenager was tucked into bed around 1 (with a bucket close by!) and the last adults (your children) saw the sun come up! Now we have a 10 year break until the next 18th, but in 13 years we’ll have an 18th & 21st within 10 days of each other… Trip to Italy sounds nice? For me! Thank you again Francesca for all of your help and hard work. The sausage rolls and quiches were a hit. I saw 2 jovial lads leave around 11ish with both hands crammed full of them for ‘travellers’. Thanks for your considered comments Mr Tool. You did a great job in your shed too, disguising all your ‘tools’ and man cave look. We might consider your shed for any future party events. I know, I know! My children, who are supposed to be quite mature, are party animals. They’re beyond reform. As for escaping future events for the other two, in your dreams, Mr Tool. As a guest, I much prefer finger food events to sit down, and omg the spread you put on was wonderful. Events I’ve attended with roving platters of food have been far less likely to result in over-intoxication of attendees. All my family have had 21st parties usually self-catered in the backyard except for my youngest sister who has a phenomenal number of friends and we hired a pub with catering. 18ths we celebrated with our friends at the pub, although Dad took me out for a lovely Italian dinner for mine, just the two of us. It’s good to reminisce about our own birthday party experiences. and those of our siblings. I don’t think much has changed- it’s usually the pub or the backyard for 18ths. I agree- finger food is the way to go. Big spreads now seem to heavy. Oh I loved reading this Francesca. Made me laugh! Not eating at parties, leaving early, having shooters! LOL … Now if I had been there. I would have loved all your gorgeous food and had a few glasses of Prosecco with you. Fantastic! I know Julie, and maybe snuck in one little shooter of Cowboy too? Ah mercy, those photos have me drooling again! It’s quite obvious that ‘a great time was had by all.’ As it should be…with all that delicious food, of which the youngun’s had very little of, how could it not be perfect? Well done!! Now I can’t understand why anyone would not want to eat all that yummy food, Francesa – whatever their age!! You will indeed. Even the simplest of meals tastes so delicious in Italy. Tremendously informative and entertaining. I had no idea! Great post! Thanks Mitchell. Hope we don’t have to do a 21st as well. What fun you all must have had! I love your down-to-earth attitude about it all. Makes everyone comfortable and relaxed. No worries, right? Yes, that’s right Grace. Except for all the preparation and cooking before hand, making my legs ache like crazy. I had left home and renting with my sister by the time I was 18 which is now 30 years ago lol. I had a group of friends and my sister who is older had her group of friends. They were outside but myself and my group didn’t quite make it outside. My mum made a heap of sponges , I can’t remember if we ate any , probably did. We had music and we had a slip and slide up the passage on polished wooden floor. A carton of cream had fallen out of the fridge and the rest is history lol very slippery. We were also finding m n’ms through the house weeks later. It was a great party. My parents gave me a 21st as I was back at home for a short while, aunties,uncles,grandmas,some school friends and a drunk then boyfriend who turned up late lol. Cakes, trifle and other fancy food and at the time my dad liked the chicken dance music OMG. I am now giving my son an 18th, he has experienced drinking already at other 18th birthdays and has seen the “bucket” or should I say drive way. We are going ,well husband is,to do paintball scirmish at 11am with about 9 of his mates. Then at 7pm that night, if they are still alive lol , have drinks and food here at home. Your party info was a good read which gives me a better idea. My son has just informed me too, 6days before his party , that him and same group are going to an 18th the night before….so paintball, hangovers, party,sleepover, hangovers, maybe breakfast…..it could be a blast or a flop lol but hey the effort will be made. Great Sandra. What a memory or two. Milestone parties are worth it. This looks amazing! And delicious!